At Outskirts Press, Inc., we take great pride in celebrating the work of our successful self-publishing authors, and we do so each week through our Self-Publishing Author Spotlight. This week we highlight self-publishing author Julie Bettendorf , who has published three successful titles with Outskirts Press. Through her series of children’s travel books, Julie shares the wonderful world of travel with children and their parents. She also reaches into the world of adult historical fiction with her third book. Learn more about Julie through this week’s Self-Publishing Author Spotlight. Julie Bettendorf is a world traveler with a background in history and a degree in archaeology. Julie shares her love of traveling and history through her books. When Julie is not traveling with her daughter Erin, and son Max, she lives in Portland, Oregon while working on her dream of writing books make history come alive for the reader – not just the history of the famous, but the history of the forgotten as well. Join Anthony Ant as he travels around the world in the first installment of the Anthony Ant book series. Follow along as Anthony travels in style, comfortably lodged in a suitcase. In Anthony Ant Goes to France, he travels to Paris, where he meets Lulu Ladybug. Together they explore the food, culture, and sights of the city. Anthony visits the Eiffel Tower and Notre Dame Cathedral, eats French pastry, and gets to know the French people, all with his new friend Lulu. The second installment of Anthony the Ant follows the friendly and curious ant as he curls up in a suitcase and gets out in Egypt, ready for the fabulous adventure of a lifetime. Anthony Ant is in Cairo, Egypt…and luckily, he meets an expert tour guide, Babu Beetle. 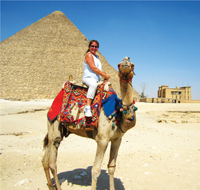 Together they explore Egypt’s history, culture, and food, with adventures including a camel ride, and a visit to the famous pyramids…and more! The second book in the Anthony Ant series continues to introduce kids to the excitement of world travel, with an enjoyable companion who is ready to share his experiences. Set against the rich tapestry of ancient Egypt, Luxor: Book of Past Lives is the story of Nebamun and Iramen, two brothers who are embalmers in Egypt during the era of the boy king, Tutankhamun. It is their duty to prepare the many bodies of the dead who land on their embalming table for a journey into the afterlife. Paralleling this ancient tale is the story of two different brothers, Abdul and Karim, who make their living by robbing the ancient tombs of Egypt in the late 1800’s, when the theft and sale of artifacts was at its peak. Woven throughout the novel are the mysterious intersections of the brothers’ lives, though separated by thousands of years. Luxor: Book of Past Lives is a masterful blend of fiction and historical detail, each chapter offering a window into the past, with details gleaned from countless historical accounts. It is a riveting tale of violence and greed, riches and poverty, and good and evil in the time of the pharaohs and beyond. Ready to tell the world your story? Get published with Outskirts Press!